A house belonging to the family of Nemer al-Jamal was blown up in Beit Sorik village, northwest of occupied Jerusalem. Israeli forces conducted 89 incursions into Palestinian communities in the West Bank and 7 similar incursions in Jerusalem. 82 civilians, including 20 children and 2 women, were arrested. 34 of them, including 19 children and the 2 women, were arrested in Jerusalem and its suburbs. A shop and part of a house were self-demolished in Silwan village. Israeli forces demolished an under-construction building and agricultural facility in al-‘Issawiyah village. A storehouse was demolished, and a container was confiscated in al-Joz Valley neighbourhood. A waterline supplying 250 dumums planted with onion was levelled in al-Baqi’ah area in the Northern Jordan Valley. A road was built for military purposes, and 300 meters of the road between ‘Atouf and al-Ras al-Ahmar were destroyed. 4 shooting incidents targeting the Palestinian fishing boats occurred in the Northern Gaza Strip, but no casualties were reported. 14 Palestinian civilians, including 6 children, were arrested at the checkpoints in the West Bank. Israeli violations of international law and international humanitarian law in the oPt continued during the reporting period (09 – 15 November 2017). During the reporting period, Israeli forces continued to use force against the protests in the West Bank. In the Gaze Strip, They also continued to chase Palestinian fishermen in the Sea and target farmers and houses in the border areas. In the Gaza Strip, as part of targeting fishermen in the sea, PCHR monitored the Israeli naval forces’ escalation against fishermen in the Gaza Sea although it was announced that the Gaza fishermen are allowed to sail to 9 nautical miles instead of 6. This proves that the Israeli forces continue their policy of targeting fishermen in their livelihoods. During the reporting period, Israeli gunboats chased fishing boats and opened fire at them 4 times; 3 of them in the north-western Beit Lahia and one in the western Soudaniyah area, west of Jabalia in the northern Gaza Strip. As part of targeting the border areas, on 09 November 2017, Israeli soldiers stationed along the border fence between Israel and the Gaza Strip, east of Gaza Valley village in the central Gaza Strip opened fire at the agricultural lands along the eastern areas. On 13 November 2017, Israeli soldiers stationed along the border fence between Israel and the Gaza Strip, east of Khan Younis in the southern Gaza Strip opened fire at the agricultural lands, east of ‘Abasan al-Kabirah. As a result in both incidents, farmers there were terrified and forced to flee and leave their work behind. Neither casualties nor property damage was reorted. In the West Bank, Israeli forces continued to use force against the protests organized by Palestinian civilians and international human rights defenders against the annexation wall, confiscation of lands and crimes of settlement expansion. During the reporting period, dozens of Palestinian civilians, international human rights defenders and Israelis organized protests in Ni’lin and Bil’in villages, west of Ramallah, al-Nabi Saleh village, northwest of the city, and Kafer Qadoum village, northeast of Qalqiliyah, in protest against the annexation wall and settlement activities. Israeli forces forcibly dispersed the protests. As a result, many of the protesters suffered tear gas inhalation while others sustained bruises due to being beaten up by the Israeli soldiers. During the reporting period, Israeli forces conducted at least 89 military incursions into Palestinian communities in the West Bank while they conducted 7 incursions into Jerusalem and its suburbs. During those incursions, Israeli forces arrested at least 48 Palestinian civilians, including a child, in the West Bank while 34 civilians, including 19 children and 2 women, were arrested in Jerusalem and its suburbs. As part of the collective punishment policy applied by the Israeli forces against the families of Palestinians accused of and/or carried out attacks against the Israeli soldiers and/or settlers, on Wednesday, 15 November 2017, Israeli soldiers blew up a house belonging to the family of Nemer Mahmoud al-Jamal in Beit Sorik village, northwest of occupied Jerusalem. The house is an apartment in a residential building. As a result of blowing up the house, the other apartments in the building sustained severe damage in addition to the nearby houses. Residents of the area said that their houses are in danger of collapse due to the severe damage and cracked walls. It should be mentioned that al-Jamal carried out an armed attack on 27 September 2017 against the soldiers stationed at the entrance to “Har Adar” settlement and killed 3 of them before al-Jamal being killed by an Israeli military force in the area. As part of house demolitions and demolition notices, on 11 November 2017, ‘Abdel Moghni Dweik self-demolished parts of his house in al-Bustan neighbourhood in Silwan village, south of Jerusalem’s Old City, upon a decision by the Israeli municipality, which threatened him of demolishing the house and charging him with all the demolition costs, which are usually very high. Dweik said that the Israeli Municipality threatened to fine him with 80,000 shekels. He added that he built his house 2 years ago and tried to obtain a license but in vain, noting that the 60-square-meter house sheltered 4 family members. On 14 November 2017, Amin al-‘Abasi self-demolished his shop in ‘Ayn al-Lozah neighborhood in Silwan village, south of East Jerusalem’s Old City, upon the Israeli Municipality’s decision. The abovementioned civilian said that his 55-square-meter shop was built of reinforced sheet 2 years ago. It should be mentioned that in the latest incursion, the municipality officers orally threatened of forcing him to pay the demolition costs in case he did not self-demolish the shop. 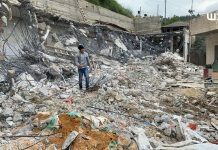 On 15 November 2017, Israeli municipality’s heavy vehicles demolished an under-construction building belonging to Ibrahim Salamah in al-‘Issawiyah village, northeast of East Jerusalem, without any prior warning. Following this, an Israeli municipality bulldozer demolished an agricultural facility belonging to ‘Omer Dari and comprised of rooms built of tin plates and a storehouse in al-‘Issawiyah village. Meanwhile in al-Joz Valley neighborhood, the Israeli municipality and Nature Authority crews demolished a storehouse and confiscated a container. As part of the demolition of houses and other civil facilities, on 13 November 2017, Israeli forces built a road for military purposes passing in the civilians’ lands in al-Ras al-Ahmar area in the Northern Jordan Valley. Meanwhile, the Israeli forces destroyed 300 meters of the road between ‘Atouf and al-Ras al-Ahmar. On the same day, the Israeli forces levelled a 70-meter waterline belonging to al-Baqi’ah Modern Company in al-Baqi’ah area in the Northern Jordan Valley. This waterline supplied 250 dunums planted with onion, so this would cause severe damage to the area. On the same day, the Israeli forces established an iron gate, which is the third of its kind in al-Khelat in al-Ras al-Ahmar area in the Northern Jordan Valley. Therefore, civilians and owners of lands can hardly reach their lands in al-Baqi’ah area. On 11 November 2017, Israeli settlers raided an archeological tomb, claiming it is a tomb for one of their ancestors namely “Othniel.” The tomb is a Palestinian archeological building on Beersheba Street where the religious rituals are held. While the Israeli soldiers were protecting settlers, an Israeli soldier attacked Ahmed Merwan Hadib (16) by hitting him with the riffle’s nozzle. As a result, Ahmed started to bleed and then taken to the government hospital in the city. A number of young men threw stones at the Israeli soldiers; meanwhile, the settlers left the area and went back behind Checkpoint 56 after finishing their religious rituals. The soldiers then randomly fired sound bombs and gas canisters at the civilians, and one of the sound bombs fell in front of Salah Wa’ed al-Zarou (22), who suffers from a mental disorder. A number of soldiers attacked him and started severely hitting him with the riffles’ butts and kicking him. He was then handcuffed, blindfolded and taken to the abovementioned military checkpoint. He was later released and taken by a PRCS ambulance to the government hospital in the city to receive medical treatment. At approximately 01:00, Israeli forces moved into Qabatyah village, southeast of Jenin. They raided and searched several houses after which they arrested 4 civilians namely Mustafa Hamdi Zakarnah (20), Mahmoud ‘Ali Jaber Zakarnah (22), Ahmed Sati Abu al-Rab (24), and Jawad Hasan kamil (19). At approximately 03:00, Israeli forces moved into ‘Aydah refugee camp, north of Bethlehem. They raided and searched a number of houses and then arrested Khader Abu Rafi’ah and Khader J’aiwi (55). At approximately 08:20, Israeli forces stationed along the border fence between the Gaza Strip and Israel, east of Gaza Valley (Johr al-Deek) in the central Gaza Strip, opened fire at agricultural lands in the eastern areas. As a result, the farmers were forced to leave their work fearing for their lives, but neither casualties nor material damage was reported. At approximately 10:00, dozens of Israeli soldiers moved into the vicinity of al-Mutanabi, al-Hajeriah, and al-Khalil Primary Schools in al-Hasin Valley area in the southern area in Hebron. This area is adjacent to the street used by the Israeli settlers from “Kiryat Arba” settlement established on confiscated lands, east of the city, to reach the Ibrahimi Mosque. The raid occured to ban establishing a celebration to be held by students on the 13th death anniversary of the Late Palestinian President Yasser ‘Arafat. The soldiers forced the students and school staff to cancel the celebration for security claims and threatened to fire tear gas canisters at the schools if the students and staffs did not obey their orders. Meanwhile, further Israeli backups arrived accompanying a settler known as “Ofer”, who cursed and insulted the teachers and students. The Israeli forces arrested 2 teachers from al-Mutanabi School namely as Ibrahim Rateb Ibrahim Zaherda (32) and Rashad Ahmed Ezreqat (28) and took them to “Kiryat Arba” settlement to interrogate them. At approximately 02:30, Israeli forces moved into Betounia village, west of Ramallah. They raided and searched several houses and then arrested Mohammed Maher al-Shawamrah (22) and Abdullah Abdul Karim al-Tarri (28). At approximately 16:00, Israeli forces moved from “Carmi Tsur” settlement into al-Thaher area, south of Beit Ummer village, north of Hebron. The soldiers deployed between houses and topped roofs of several houses belonging to Baher family. A number of youngsters gathered and threw stones at the Israeli soldiers, who fired tear gas canisters at them in response. However, no incidents were reported. Note: During the aforementioned day, Israeli forces conducted (7) incursions in the following areas and no arrests were reported: Shuweikah Suburb, east of Tulkarm; Bruqin and Kafer al-Deek villages, west of Salfit; Sa’ir, Bani Na’im, al-Burj, and Deir Samet villages in Hebron. At approximately 01:30, Israeli forces moved into Ya’bud village, southwest of Jenin. They raided and searched a number of houses after which they arrested Khalid Fathi Zaki Abdullah Abu Baker (20), Mahmoud Bassam Hamarshah (19) and Noor Eden Mahmoud Ibrahim Qabha (22). Note: During the aforementioned day, Israeli forces conducted (7) incursions in the following areas and no arrests were reported: Shuweikah Suburb, east of Tulkarm; Far’oun village, south of the city; Bruqin and Kafer al-Deek villages, west of Salfit; Birzeit village, northwest of Ramallah; al-Shuyoukh and Beit Awla villages in Hebron. At approximately 01:00, Israeli forces moved into Jenin refugee camp, west of Jenin. They raided and searched a number of houses and then arrested 4 civilians namely Mohammed (20), Ehab Hasan Wushahi (21), Omer Mohammed al-Sa’di (20), and Yahya Mahmoud Balalu (26). At approximately 02:00, Israeli forces moved into Kafer Dan village, west of Jenin. They raided and searched several houses and then handed summonses to 4 civilians namely Mohammed Mohyee Eden Salah (21), Maher Hani ‘Abed (200, Baraa’ Mohammed Sobhi ‘Abed (19), and Ahmed Abdul Rahman ‘Abed (26), to refer to the Israeli Intelligence Service in Salem military camp, west of the city. At approximately 06:25, Israeli gunboats stationed off al-Sudaniyah shore, west of Jabalia in the northern Gaza Strip, opened fire at Palestinian fishing boats sailing within 4 nautical miles and chased them. The shooting continued for 20 minutes. As a result, the fishermen were forced to flee fearing for their lives, but neither casualties nor material damage was reported. At approximately 08:05, Israeli gunboats stationed offshore, northwest of Beit Lahia in the northern Gaza Strip, opened fire at Palestinian fishing boats sailing within 3 nautical miles and chased them. As a result, the fishermen were forced to flee fearing for their lives, but neither casualties nor material damage was reported. Note: During the aforementioned day, Israeli forces conducted (9) incursions in the following areas and no arrests were reported: Dura, Deir al-‘Asal, Beit Ummer and Sa’ir villages in Hebron; Shuweikeh Suburb, east of Tulkarm; Nazlah and Baqah al-Sharqiyah villages, north of the city; Far’oun village, south of the city, and Deir Ballout village, west of Salfit. At approximately 02:00, Israeli forces moved into al-Dheisheh refugee camp, south of Bethlehem. They raided and searched several houses after which they arrested Wa’el Khalil ‘Atallah (23), ‘Omran (28) and his brother Ma’ali ‘Essa Ma’ali (36). Around the same time, Israeli forces moved into Beit Awa village, southwest of Dura, southwest of Hebron. They raided and searched a house belonging to Na’im Abdul Hamid Masalmah (36) and then arrested him. At approximately 03:00, Israeli forces moved into Bethlehem. They raided and searched a house belonging to Walid Mohammed Nowarah and then arrested him. At approximately 04:00, Israeli forces moved into Taqou’ village, east of Bethlehem. They raided and searched a house belonging to Muhanned Husain Abdul Khalil al-Badan (20) and then arrested him. At approximately 09:00, Israeli gunboats stationed offshore, northwest of Beit Lahia in the northern Gaza Strip, opened fire at Palestinian fishing boats sailing within 2 nautical miles and chased them. As a result, the fishermen were forced to flee fearing for their lives, but neither casualties nor material damage was reported. Note: During the aforementioned day, Israeli forces conducted (13) incursions in the following areas and no arrests were reported: Hebron, Tulkarm, al-Burj village, Shuweikah Suburb, and Noor Shams refugee camp, east of the city; ‘Ezbet Shufah village, southeast of the city; Qafin, Baqah al-Sharqiyah, Zetaa, Nazlet ‘Essa villages, Nazlet Abu al-Nar, al-Nazlah al-Wusta, north of the city, and Beit Ummer village, north of Hebron. At approximately 01:30, Israeli forces moved into Yatta, south of Hebron, and stationed in al-Faqir and Roq’ah neighborhood. They raided and searched 2 houses belonging to Mahmoud Jebril Makhmrah (51), Nezar Mousa Mohammed (21) and then arrested them. At approximately 00:50, Israeli force moved into Kafer al-Deek village, west of Salfit. They raided and searched a house belonging to Nabil Abdullah ‘Ali Ahmed (55) and then arrested him. At approximately 02:00, Israeli forces moved into ‘Arabah village, southwest of Jenin. They raided and searched a house belonging to Tareq Husaim ‘Awad Dar Husain Qa’dan (45) and then arrested him. It should be noted that Qa’dan is member of the Islamic Jehad Movement in the West Bank. Around the same time, Israeli forces moved into Taqou’ village, east of Bethlehem. They raided and searched a number of houses and then arrested Mohammed Na’el Hamdah (20) and Yusuf Jamal Sabbah (18). At approximately 03:30, Israeli forces moved into Beit Ummer village, north of Hebron, and stationed near Tomb of prophet Matta (Matthew) in the center of the city. They raided and searched a house belonging to Mohammed Abdul Jawad Ekhleil (55) and then arrested his son Amir (19). Around the same time, Israeli forces moved into al-Waljah village, west of Bethlehem. They raided and searched a house belonging to Husam Omer Abu Khalifa (17) and then arrested him. 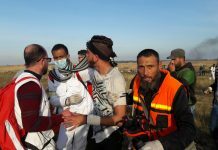 At approximately 08:00, Israeli forces stationed along the border fence between the Gaza Strip and Israel, east of Khan Yunis in the southern Gaza Strip, opened fire at Palestinian agricultural lands located into the east of ‘Abasan al-Kabirah. As a result, the farmers were forced to leave their work and flee fearing for their lives, but neither casualties nor material damage was reported. Note: During the aforementioned day, Israeli forces conducted (7) incursions in the following areas and no arrests were reported: Hebron, Halhoul, al-Thaheriyah, Ethna, Baqah al-Sharqiyah, Zeta and Nazlet al-Nar villages, northeast of Tulkarm. At approximately 00:30, Israeli forces moved into Qafin village, north of Tulkarm. They raided and searched a house belonging to Ahmed ‘Adel Mahmoud ‘Ammar (23) and then arrested him. Around the same time, Israeli forces moved into Siada village, northeast of Tulkarm. They raided and searched 2 houses belonging to Eyad Lutfi al-Ashqer (24) and Nidal Bilal ‘Ajaj (22) and then arrested them. At approximately 00:50, Israeli forces moved into Tulkarm. They raided and searched several houses and then arrested 3 civilians namely ‘Alaa’ Abu Shanab (22), Khaldoun Mohammed al-Qetta (23), and Hesham Rabah Farij (24). At approximately 01:00, Israeli forces moved into Beit Ummer village, north of Hebron, and stationed in Khelat al-‘Ein, al-Ettesalat and al-Khellah neighborhoods. They raided and searched 4 houses belonging to Mohammed ‘Essa Mousa ‘Awad, ‘Essa Mohammed Mousa ‘Awad, whose house windows were broken by the soldiers, Montaser Abdul Hamid ‘Awad where the Israeli soldiers damaged the floor tiles claiming to search for weapons, and Mohammed Kamel Mousa Za’aqiq. After three hours, the Israeli forces withdrew, and no arrests were reported. Around the same time, Israeli forces moved into Qalqiliyah, southeast of Jenin. They raided and searched a number of houses and then arrested 3 civilians namely ‘Ali Yusuf Kamil (32), Abdul Rahman Mohammed al-Rab (30), and Ibrahim Khalid Saba’nah (22). Around the same time, Israeli forces moved into Deir Abu Mash’al village, northwest of Ramallah. They raided and searched a house belonging to Bara’a Saleh ‘Ata. The soldiers locked the family members in one room and searched the house for 3 hours. They then arrested Bara’a’s brother Nidal Saleh ‘Ata (19). They also confiscated about NIS 5,000. At approximately 02:00, Israeli forces moved into Tulkarm. They raided and searched a house belonging to Mo’ath ‘Ammar Haroun (30) and then arrested him. It should be noted that Mo’ath is a former prisoner since 2012 as he served 2 years imprisonment in the Israeli prisons. Around the same time, Israeli forces moved into Ethna village, west of Hebron, and stationed into the west of the village. They raided and searched 2 houses belonging to Tareq Ibrahim ‘Awad (25) and Mohammed ‘Ali Abu jahishah (30) and then arrested them. At approximately 16:30, Israeli forces moved into Tulkarm for the second time. They raided and searched a house belonging to Mohammed Jamal Abu Hasnah (22) and then arrested him. Note: During the aforementioned day, Israeli forces conducted (14) incursions in the following areas and no arrests were reported: al-Samou’, Karmah, Deir Razeh villages and Dura in Hebron; Shuweikah Suburb, Noor Shams refugee camp, ‘Atil, ‘Alar, Deir al-Ghusoun and Bal’a villages, north of Tulkarm; Nazelt ‘Essa and al-Jaroushiyah villages, southeast of the city; Joyous village, north of Qalqiliyah; and Deir Estia village, northwest of Salfit. At approximately 02:00, Israeli forces moved into al-‘Obaidiyah village, east of Hebron. They raided and searched a house belonging to Amin Dawoud al-‘Esawi and then arrested him. At approximately 08:30, Israeli gunboats sailing offshore, northwest of Beit Lahia in the northern Gaza Strip, opened fire at Palestinian fishing boat sailing within 3 nautical miles and chased them. As a result, the fishermen were forced to flee fearing for their lives, but neither casualties nor material damage was reported. Note: During the aforementioned day, Israeli forces conducted (3) incursions in the following areas and no arrests were reported: ‘ Ejjah village, south of Jenin, Fahmah village, southwest of the city, and Howrah village, south of Nablus. Following Friday prayer on 10 November 2017, dozens of Palestinian civilians, international human rights defenders and Israelis organized protests in Ni’lin and Bil’in villages, west of Ramallah, al-Nabi Saleh village, northwest of the city, and Kafer Qadoum village, northeast of Qalqiliyah, in protest against the annexation wall and settlement activities. Israeli forces forcibly dispersed the protests, firing live and metal bullets, tear gas canisters and sound bombs. They also chased the protesters into olive fields and between houses. As a result, many of the protesters suffered tear gas inhalation while others sustained bruises due to being beaten up by the Israeli soldiers. Following the end of Friday prayer, dozens of civilians from Kherbet Qalqas, east of Hebron, organized a protest at the southern entrance to the village that has been closed by the Israeli forces for 17 years under security claims, hindering the movement of the village residents. Large Israeli forces arrived at the area, and an Israeli officer in the Civil Administration known as “Hariz” promised the residents to find solutions. However, the soldiers threatened the residents if they do not leave the area they will use force to disperse them. It should be noted that the village residents are about 1300 persons, who take dirt roads while others use the entrance, which is closed with sand down to the main street. During those years, 7 deaths were reported in the village due to run-over accidents by the vehicles on the bypass road when civilians walk on it. As part of the collective punishment policy applied by the Israeli forces against the Palestinian families of those accused of carrying out attacks against the Israeli forces and/or settlers, on Wednesday, 15 November 2017, Israeli forces blew up a house belonging to the family of Nemer Mahmoud al-Jamal from Beit Sorik village, northwest of occupied Jerusalem. According to PCHR’s investigation and eyewitnesses’ accounts, at approximately 05:00 on Wednesday, large force of Israeli soldiers moved into Beit Sorik village, northwest of occupied Jerusalem and imposed a security cordon on it. They then surrounded the neighborhood, raided the house of Nemer Mahmoud al-Jamal and forced its residents, who were about 15 persons, to leave it immediately. The soldiers also evacuated the neighboring houses and gathered all the residents in a school yard in the village. Following that, special forces planted a big amount of explosives in the house, which is an apartment in a residential building and then blew it up. As a result, the apartment was demolished, and the other apartments sustained cracks. Moreover, the owners of the neighboring houses said that their houses might collapse due to the material damage as the walls cracked. It should be noted that the Israeli forces handed the family through their lawyer an evacuation decision until the 4th of this month in preamble to demolish it. They also raided the house on 09 November 2017 and handed al-Jamal family a decision to evacuate the house within a week to demolish it. It should be noted that al-Jamal carried out an armed attack on 27 September 2017 against Israeli soldiers stationed at the entrance to “Har Adar” settlement. As a result, 3 soldiers were killed and then al-Jamal was killed by an Israeli military force that was in the area. PCHR apologizes for not publishing the tables of the Movement at Beit Hanoun and Karm Abu Salem Crossings and will publish them in the weekly report next week. On Thursday 09 November 2017, Israeli forces established 2 checkpoints at the entrances to Beit Ummer village and al-Fawar refugee camps. On Friday, 10 November 2017, Israeli forces established 3 checkpoints at the entrances to al-Dahiriyia and al-Hadab villages and at the entrance to al-‘Aroub refugee camp. On Saturday, 11 November 2017, 4 similar checkpoints were established at the entrances to Yatta, Samou’a, and al- Simah villages and on al-Fahes road, south of Hebron. On Sunday, 12 November 2017, Israeli forces established 4 checkpoints at the entrances to Ethna and Sureef villages, at the western entrance to Hebron, and at the entrance to ‘Oyoun Abu Said Road. On Monday, 13 November 2017, 2 similar checkpoints were established at the northern entrance to Hebron and at the entrance to al-Shayyoukh village. On Tuesday, 14 November 2017, Israeli forces established 2 checkpoints at the western entrance to Hebron and at the northern entrance to Halhoul village. At approximately 11:00 on Thursday, 09 November 2017, Israeli forces established a checkpoint at the entrance to ‘Azoun village, east of Qalqiliyia. On 11 November 2017, Israeli forces established 2 checkpoints at the eastern entrance to Qalqiliyia and at the entrance to ‘Azoun village, east of the city. At approximately 13:20 on Sunday, 12 November 2017, Israeli forces re-established the checkpoint again. At approximately 10:25 on Thursday, 09 November 2017, Israeli forces established a checkpoint at the entrance to Salfit. On 11 November 2017, Israeli forces established 2 checkpoints at the northern entrance to Salfit and at the entrance to Kaful Hares village, north of the city. At approximately 13:25 on Sunday, 12 November 2017, the Israeli forces re-established the checkpoint again at the entrance to Kaful Hares village. At approximately 13:20 on Sunday, 12 November 2017, Israeli forces established a checkpoint at the eastern entrance to Tulkarm. On Thursday, 09 November 2017, Israeli forces established a checkpoint at the main entrance to al-Nabi Saleh village, northwest of Ramallah. They searched Palestinian civilians’ vehicles and checked their IDs. During which, an Israeli soldier severely beat Ramiz Yehia Rahimy (17), from Beit Rimah village. At approximately 14:00 on Thursday, 09 November 2017, Israeli forces stationed at the northern entrance to Bethlehem, arrested Ahmed Muhanad al-‘Izzah (11), from al-‘Izzah refugee camp, north of the city. The Israeli forces took Ahmed to an unknown destination without revealing the arrest reasons. At approximately 10:00 on Friday, 10 November 2017, Israeli forces established a checkpoint at the entrance to Ya’boud village, branching from Nablus-Jenin Street. The Israeli forces stopped Palestinian civilians’ vehicles and checked the passengers’ IDs. They then arrested Mohamed Khalid Sa’ied Kamil (22), from Qabatia village, southeast of the city. Around the same time, Israeli forces established a checkpoint at the entrance to al-Dahiriyia village, south of Hebron. The Israeli forces stopped Palestinian civilians’ vehicles and checked the passengers’ IDs. They then arrested Ahmed ‘Amer Nassar (21), from Madamah village, south of Nablus. At approximately 17:30 on Friday, 10 November 2017, Israeli forces arrested the Jerusalem’s Suburbs Police Chief, Colonel Ali al-Qumiri, while he was on his way back home in Ramallah. He was arrested at a military checkpoint in “Gosh ‘Etzion” area, south of Bethlehem. The Israeli forces claimed that Ali was arrested because he has secret information, so his detention was extended. The Jerusalem’s Suburb Police stated that the Colonel Ali al-Qumiri is arrested pending investigation in al-Maskobiyia Police Station in West Jerusalem. Persons close to Ali said that his arrest may be on grounds of chasing drug dealers and thieves by the Jerusalem’s Suburb Police. On Sunday, 12 November, Ali was released. At approximately 21:00 on Friday, Israeli forces arrested 4 civilians, including 2 children, from Nahaleen village, west of Bethlehem, while they were at the eastern entrance to the village. The Israeli forces claimed that the Israeli forces chased and then arrested a number of Palestinian young men attempted to sneak into “Neve Daniel” settlement in “Gosh Etzion” Complex, south of Bethlehem. The arrested persons were then taken to the Israeli Intelligence Service for interrogation. The arrested persons were identified as Mo’min Mohamed Mahmoud Fanoun (22), Mahmoud Ibrahim Fanoun (27), Dawoud Mahmoud Fanoun (17), and Jamal Mohamed Fanoun (17). At approximately 08:00 on Monday, 13 November 2017, Israeli forces stationed at a military checkpoint established at the entrance to al-Salimah neighborhood, north of al-Ibrahim Mosque in Hebron’s Old City, arrested 3 children while heading to school. The Israeli forces claimed that the children threw stones at the Israeli soldiers. The children were then taken to al-Ibrahim Mosque police station and then handed him to the Palestinian Liaison. The children were identified as Samer Hussain Nahnoush (12), Othman Ibrahim Murad (11), and Abed al-Raheem Abed al-‘Azeez al-Rajbi (12). At approximately 16:00 on Monday, Israeli forces arrested Khalil Zahran Abu Qubitah (26), from Roq’a neighborhood in Yatta, south of Hebron, after stopping him at a military checkpoint at the northern entrance to the city. At approximately 20:00 on Monday, Israeli forces established a checkpoint near al-Majd Petrol Station between ‘Aqabah and Tubas. The Israeli forces stopped Palestinian civilians’ vehicles and checked the passengers’ IDs. They then arrested Mohammed Jameel Moahmed Sawaftah (30). On Wednesday, 15 November 2017, Israeli forces established a checkpoint at the entrance to Jabi’ village, south of Jenin. The Israeli forces stopped Palestinian civilians’ vehicles and checked the passengers’ IDs. They then arrested Ma’moun Ghasan Abu ‘Oun (25), from Qabatia village, southeast of the city. At approximately 00:00 on Thursday, 09 November 2017, Israeli forces moved into Beit Sorik village, northwest of occupied East Jerusalem. They raided and searched a house belonging to Nemer al-Jamal and handed his family a decision to vacate the house within this week to demolish it. At approximately 02:00 on Thursday, Israeli forces moved into Hizmah village, northeast of occupied East Jerusalem. They raided and searched a house belonging to Khattab al-Khatib and arrested his son Suliman (24) and his daughter Mervat. At approximately 11:00 on Friday, 10 November 2017, Israeli forces arrested Rami ‘Emad Mmansour (19), from Qalandia refugee camp, north of occupied Jerusalem. Rami was arrested while he was near “Kochav Ya’akov” settlement, northeast of the city. The Israeli police later issued a statement claiming that Rami was arrested under the pretext of attempting to carry out a stabbing attack in the area. At approximately 18:30 on Saturday, 11 November 2017, Israeli forces arrested Ameer Khalid Abu Mefreh (15) while walking in al-Tour neighborhood, east of occupied East Jerusalem’s Old City. At approximately 01:30 on Sunday, 12 November 2017, Israeli forces moved into many neighborhoods in Silwan village, south of occupied East Jerusalem. They raided and searched many houses from which they arrested 5 civilians, including 4 children. The arrested persons were then taken to al-Mascobiyia police center in West Jerusalem. They arrested persons were identified as Abed al-Rahman Showiki (14), Qusai Husam Zaitoun (13), ‘Imran Mofeed Mansour (15), Mahdi Mofeed Mansour (12) and Khalid Waleed Abu Maiyalah (20). At approximately 18:00 on Sunday, Israeli forces moved into Beit Haninah neighborhood, north of occupied Jerusalem. They raided a house belonging to the colonel in the Palestinian police, Hussain al-Kasawani, who was not home during the incursion. The Israeli forces then arrested his wife and 2 children, taking them to a police station in “Prophet Jacob” Colonel Hussain al-Kasawani said that the Israeli forces along with Israeli Intelligence officers raided and searched his house for 3 hours and then arrested his wife and 2 children. He added that the Israeli forces called him and summoned him for interrogation. Al-Kasawani said that the Israeli Intelligence Service did not tell him anything about the arrest or summons reasons. It should be noted that the Israeli forces arrested the Police Chief of Jerusalem’s Suburbs, Colonel Ali al-Qumairi, 2 days ago and asked him about the Palestinian Security Services’ activities in the areas around occupied Jerusalem. The Israeli forces released later him. At approximately 01:00 on Tuesday, 14 November 2017, Israeli forces moved into many neighborhoods in Silwan village, south of occupied East Jerusalem’s Old City. They raided and searched many houses from which they arrested 5 children. The arrested children were identified as Mo’taz Abdullah Zaytoun (15), Mohamed Zaytoun (16), Qusai Nidal al-Rajbi (11), ‘Odai al-Rajbi (16) and Mahdi Qara’een (14). At approximately 03:00 on Tuesday, 14 November 2017, Israeli forces moved into ‘Anata village, northeast of occupied East Jerusalem. They raided and searched a house belonging to Baraa’ Khalil ‘Isaa (22) and arrested him. At approximately 00:30 on Wednesday, 15 November 2017, Israeli forces moved into al-Tour neighborhood, east of occupied East Jerusalem. They raided and searched houses from which they arrested 16 civilians, including 7 children. The arrested persons were then taken to Salah al-Deen Police Station for investigation. PCHR keeps the names of the arrested persons. On Saturday, 11 November 2017, ‘Abed al-Moghni al-Doweek self-demolished parts of his house in al-Bustan neighborhood in Silwan village, south of occupied East Jerusalem’s Old City, after the Israeli municipality threatened to demolish his house and force him to pay all demolition costs. Al-Doweek said that on Saturday, he vacated his house contents and then demolished it to implement the Municipality decision. The Israeli Municipality threatened him to fine him with NIS 80,000, unless he demolished it himself. Abed al- Moghni said that his house was built 2 years ago and he attempted to license it but in vain. The abovementioned 60-square-meter house was comprised of 2 rooms and sheltered 4 persons. On Friday, 10 November 2017, the Israeli Municipality staff, under the Israeli forces’ protection, moved into Silwan village, south of occupied East Jerusalem’s Old City. The Municipality staff took photos of the houses and streets in many neighborhoods before handing house demolition notices to civilian under the pretext of non-licensing. On Monday, 13 November 2017, the Israeli Municipality staff took photos of shops in al-‘Issawiyia village, northeast of occupied Jerusalem. Mohamed Abu al-Humus, Member of al-‘Issawiyia Follow-up Committee, said that the Israeli Municipality staff accompanied with an Israeli military force moved into al-‘Issawiyia village and took photos of 5 shops, including a pharmacy. He also said that the Municipality staff hanged a decision to vacate and remove a commercial container in the village. It should be noted in the morning that the Municipality staff handed administrative demolition notices and summonses for many civilians, ordering them to refer to the Israeli Municipality, west of the city, regarding their houses under the pretext of building without licenses. At approximately 17:00 on Monday, 13 November 2017, Ameen al-‘Abasi self-demolished his shop in ‘Ain al-Louza neighborhood, south of occupied East Jerusalem’s Old City, to implement the Israeli Municipality decision. Ameen said that he forced to demolish his house after the Israeli Municipality raided his shop many times and 2 weeks ago the Municipality raided the shop and hanged a demolition decision issued by the Israeli Court. The Israeli Municipality gave Ameen 30 days to carry out the demolition. Ameen said that his 55-square-meter shop was built of tin plates 2 years ago. It should be noted that the Israeli Municipality staff orally threatened him of paying the Municipality’s demolition costs, if he did not obey the orders. At approximately 09:00 on Wednesday, 15 November 2017, Israeli Municipality bulldozer without prior warning demolished an under-construction residential building in al-‘Issawiyia village, northeast of occupied East Jerusalem, under the pretext of non-licensing. Mohamed Abu al-Humus, Member of al-‘Issawiyia Follow-up Committee, said that the Israeli forces accompanied with the Israeli Municipality staff and bulldozers moved into al-‘Issawiyia village and stationed in the center of the village. The Israeli forces surrounded a residential building belonging to Ibrahim Mousa Salamah and denied him access to the building. They then demolished the building under the pretext of non-licensing. Ibrahim Salamah said that he was surprised with a phone call from one of the neighbors informing him of the demolition. When Ibrahim arrived at the village, the Israeli forces refused to allow him to enter the area until they finish the demolition. Ibrahim said that he received a demolition decision under the pretext of licensing months ago, and his lawyer managed to extend the demolition decision until Wednesday, 15 November 2017, but the Israeli municipality bulldozers demolished the building without waiting the court to issue the decision to stop the demolition. It should be noted that Salamah built the 350-square-meter building 8 months ago comprised of 2 floors and another one under-construction. Lately, the Israeli Municipality targeted al-‘Issawiyia village by raiding the village and taking photos of houses, buildings and shops. In al-Joz Valley neighborhood, northeast of occupied East Jerusalem’s Old City, the Israeli Municipality accompanied with the Nature Authority staff demolished a storehouse and also confiscated a container in Imro’a al-Qais Street in Wad al-Jouz neighborhood. At approximately 08:00 on Monday, 13 November 2017, Israeli forces accompanied with 2 military bulldozers moved into Ras al-Ahmar area in Northern Jordan Valley, east of Tubas. The bulldozers built a road for military purposes in the civilian’s lands. The road is 1000 meters long and 6 meters wide. While building the road, the Israeli forces destroyed parts of a road between ‘Atouf and Ras al-Ahmar. The destroyed parts were 300 meters long. This project was carried out at the end of 2016 and donated by institutions in the European Union (EU). At approximately 09:00 on Monday, Israeli forces accompanied with a bulldozer moved into al-Boq’iyia al-Haditha area in Northern Jordan Valley, east of Tubas. The bulldozer demolished a 700- meter -long water line belonging to al-Boq’iyia al-Haditha Company. It should be noted that the abovementioned water line was supplying a 250-dumums planted with onion. This demolition completely damaged the area. At approximately 14:30 on Monday, Israeli forces accompanied with a bulldozer and a crane moved into al-Khilaat area in al-Ras alAhmar in Northern Jordan Valley. They established an iron gate in the area, which is the 3rd one in the area. As a result, civilians and lands’ owner were denied access to their lands located in al-Boqi’a area. On Tuesday, 14 November 2017, Israeli forces accompanied with a military vehicle and a vehicle of the Israeli Civil Administration moved into Khelit al-Dabie’ area, between “Mitzpe Yair” and “Maon” settlements, east of Yatta, south of Hebron. The Israeli Civil Administration officer handed Jaber Ali al-Dababsah (39) a notice to stop construction and vacated his 40-square-meter house, which is comprised of 2 rooms built of bricks and roofed with tin plates, under the pretext of non-licensing. Jaber was given 7 days to carry out the orders. At approximately 14:55 on Tuesday, Israeli forces accompanied with a vehicle of the Israeli Civil Administration moved into Hares village, northwest of Salfit. The Israeli Civil Administration officer handed a notice to stop building of an under-construction house belonging to Husam Ali Jaber. Moreover, Jameel Moahmed Dawoud was handed a notice to stop construction a barrack for breeding livestock, under the pretext of non-licensing in the area (C) which is under the Israeli control, according to Oslo Accord. At approximately 08:00 on Monday, 13 November 2017, Israeli forces accompanied with 2 military bulldozers moved into Ras al-Ahmar area in Northern Jordan Valley, east of Tubas. The bulldozers built a 1000-meter road for military purposes on Palestinians’ lands. While building the road, the Israeli forces destroyed 300 meters of the road between ‘Atouf and Ras al-Ahmar. At approximately 09:00 on Monday, Israeli forces accompanied with a bulldozer moved into al-Boq’iyia al-Haditha area in Northern Jordan Valley, east of Tubas. The bulldozer demolished a 700-meter waterline belonging to al-Boq’iyia Modern Company. It should be noted that the abovementioned waterline was supplying 250 dumums planted with onion, so this would completely damage the area.At approximately 14:30 on Monday, Israeli forces accompanied with a bulldozer and crane moved into al-Khilaat area in al-Ras alAhmar in Northern Jordan Valley. They established an iron gate in the area, which is the 3rd of its kind in the area. As a result, civilians and lands’ owner were denied access to their lands in al-Boqi’a area. On Tuesday, 14 November 2017, Israeli forces accompanied with a military vehicle and vehicle of the Israeli Civil Administration moved into Khelit al-Dabie’ area, between “Mitzpe Yair” and “Maon” settlements, east of Yatta, south of Hebron. The Israeli Civil Administration officer handed Jaber Ali al-Dababsah (39) a notice to stop the construction and vacated his 40-square-meter house, which is comprised of 2 rooms built of bricks and roofed with tin plates, under the pretext of non-licensing. Jaber was given 7 days to apply the notice. At approximately 14:55 on Tuesday, Israeli forces accompanied with a vehicle of the Israeli Civil Administration moved into Hares village, northwest of Salfit. The Israeli Civil Administration officer handed a notice to stop the construction works in an under-construction house belonging to Husam Ali Jaber. Moreover, Jameel Moahmed Dawoud was handed a notice to stop construction works in a barrack for breeding livestock under the pretext of non-licensing in Area (C) which is under the Israeli control, according to Oslo Accords. On Thursday, 09 November 2017, Israeli settlers from the outposts in Hebron’s Old City, set up tents in in al-Ibrahimiyah yard adjacent to the Ibrahimi Mosque in order to receive settlers coming to the city to celebrate the “Sarah Shabbat”. This coincided with the Israeli closure of the area and tightening the security measures in the vicinity of the Ibrahimi Mosque and checkpoints leading to the Old City. The Israeli forces also prevented civilians outside the village from entering the area. At approximately 10:00 on Saturday, 11 November 2017, Israeli forces closed Bab al-Zawiyia area and Beersheba Street in the center of Hebron and forced the shops’ owners to close. A large force of Israeli soldiers and border guard officers deployed in the area in preparation for the arrival of Israeli settlers via the closed Shushed Street at an archeological site, which the settlers claim it is a tomb for one of their ancestors namely “Othniel.” The tomb is a Palestinian archeological building on Beersheba Street where the religious rituals are held. While settlers were passing by, some of them attempted to climb to remove the Palestinian flags attached to the shops’ doors in the area. The Palestinians who were in the area expressed their anger by chanting slogans and exclaiming Allah is great under the very eye of the Israeli soldiers. During the soldiers’ movement between the gathered civilians, an Israeli soldier attacked Ahmed Merwan Hadib (16) by hitting him with the riffle’s nozzle. As a result, Hadeeb started to bleed and then taken to the government hospital in the city. A number of young men threw stones at the Israeli soldiers; meanwhile, the settlers left the area and went back behind Checkpoint 56 after finishing their religious rituals. The soldiers then randomly fired sound bombs and gas canisters at the civilians, and one of the sound bombs fell in front of Salah Wa’ed al-Zarou (22), who suffers from a mental disorder. As a result, his pants was torn, and a number of soldiers attacked him and started severely hitting him with the riffles’ butts and kicking him. He was then handcuffed, blindfolded and taken to the abovementioned military checkpoint. A number of civilians attempted to intervene so he would be released, but in vain. His detention continued for a few hours before being released and taken by a PRCS ambulance to the government hospital in the city to receive medical treatment.